O God, who founded all the commands of your sacred Law upon love of you and of our neighbor, grant that, by keeping your precepts, we may merit to attain eternal life. Through our Lord Jesus Christ, your Son, who lives and reigns with you in the unity of the Holy Spirit, one God, for ever and ever. "Brothers and sisters: Christ will be magnified in my body, whether by life or by death. For to me life is Christ, and death is gain. If I go on living in the flesh, that means fruitful labor for me. And I do not know which I shall choose. I am caught between the two. I long to depart this life and be with Christ, for that is far better. Yet that I remain in the flesh is more necessary for your benefit (Philippians 1:20c-24)." The first reading is taken from the Book of the Prophet Isaiah 55:6-9. In this text the prophet urges the Chosen People to seek Yahweh, to come close to Him in friendship. To do this the sinner must abandon his evil ways. He need not fear: Yahweh is "rich in forgiving," He will forgive all sins of a repentant sinner. Though He is infinite and transcendent, yet He can and does come close to and is a true friend of all who seek Him. He is a personal God, not an abstract idea. The second reading is from the Letter of St. Paul to the Philippians 1:20c-24, 27a. St. Paul wrote the letter from a prison cell in Rome or possibly Ephesus. It is a friendly letter, giving some news of his work to the converts in Philippi, warning them against certain enemies of the faith and exhorting them to remain humble. The Gospel is from St. Matthew 20:1-16a. The call to the vineyard (to the Church), through God's gift of faith and the sacrament of baptism, is a gift for which we can never sufficiently thank God. If we remain in the vineyard and labor honestly, that is, if we cooperate with the actual graces God is continually giving us, we are assured of reaching heaven when our earthly days are ended. The work we have to do in God's vineyard is the fulfilling of the duties of our state in life. By carrying out these duties faithfully and honestly we are doing the will of God and earning heaven. The greater part of our day and indeed of our life, will be taken up with tasks of themselves worldly, but these tasks when done in the state of grace and with the intention of honoring God, have a supernatural value. For this we have to thank God for His goodness and generosity. He could have made the attainment of heaven so much more difficult. He could have demanded extraordinary mortifications and renunciations and the reward (heaven) would still be exceedingly great. Instead He allows us to live our everyday life, to enjoy the love and friendship of our family and friends, to satisfy the natural desires of our bodies, within the commandments, and yet to merit a supernatural reward while so doing. As He tells us through St. Paul: "whether you eat or drink or whatever else you do, do all to the glory of God (1 Cor. 10 : 31)." Looking back on our past life, how many years have we really given to God since we came to the use of reason? Those school years, the time spent learning a trade or profession, the weeks, months, years working in an office or factory or farm, the hours among the pots and pans in the kitchen — have we earned some credit in heaven for all of this, or is it all crossed off our pay sheet through lack of right intention or through sin? If so, those years are lost to us. We were "idle" all that time. Today's parable, however, should give us new hope and courage. It may be the sixth or the ninth or even the eleventh hour of our life but we can still earn heaven if we listen to God's call and set to work diligently in His vineyard. If we put our conscience right with God today and resolve to be loyal to Him from now on He will be as generous to us, as the parable promises. "'For everyone who exalts himself shall be humbled, and he who humbles himself shall be exalted" (Gospel). 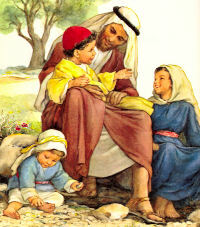 Jesus reveals His Love by curing the victim of dropsy (pictured at the left). Love overcomes all human obstacles. The humble man does not, of course, expose his talents to the contempt of others. But he does recognize that every best gift is from above, loaned not for himself alone, but for his less favored neighbor as well. For this reason I bend my knees to the Father (Epistle), exclaims St. Paul, as he reflects on His glorious riches: how Divine love PURGES us by strength through His Spirit, ILLUMINATES us through our faith and then UNITES us in Christ's love. . .unto. . .the fullness of God. Humbly must we recognize the power that is at work in us.